Written by Donal O’Kelly and performed by Katie O’Kelly, Joyced! is a race through the events and characters of Dublin in 1904 which influenced the 22 year old James Joyce and informed the narrative of Ulysses. The piece is tightly structured, packed with biographical information and often using Joyce’s own words. Katie O’Kelly takes the story at breakneck speed bringing the characters to life and giving them a voice. You tremble with Joyce’s sisters, gathered round the kitchen table, listening to their father, John Stanislaus, as he returns home from the pub. It might require some familiarity with a biography of Joyce to recognise Alfred Hunter or the significance of the singing contest, but the incident in the Martello Tower and the librarian Magee (John Eglinton) are straight from the pages of Ulysses. 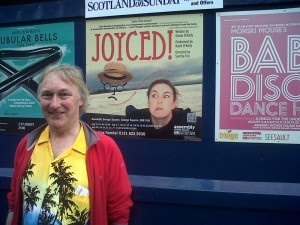 The Edinburgh Festival run finished at the end of August but watch out for Joyced! if it comes your way.